What you need to know about this additional profit center. “I’ve made enough money today,” said no successful business owner ever. While it’s no secret that many carwash operators in this industry are currently experiencing healthy sales these days, going beyond your business’ core competency is a great way to generate additional profits and create customer loyalty. Paint chips, as opposed to dents and dings that usually occur as the result of a significant impact, will affect vehicles over the course of normal use and driving. Paint chips are the result of such factors as rocks kicking up during driving and impacting a car, but they are also found around commonly touched surfaces, especially around areas that are often slammed shut, such as doors and hoods. 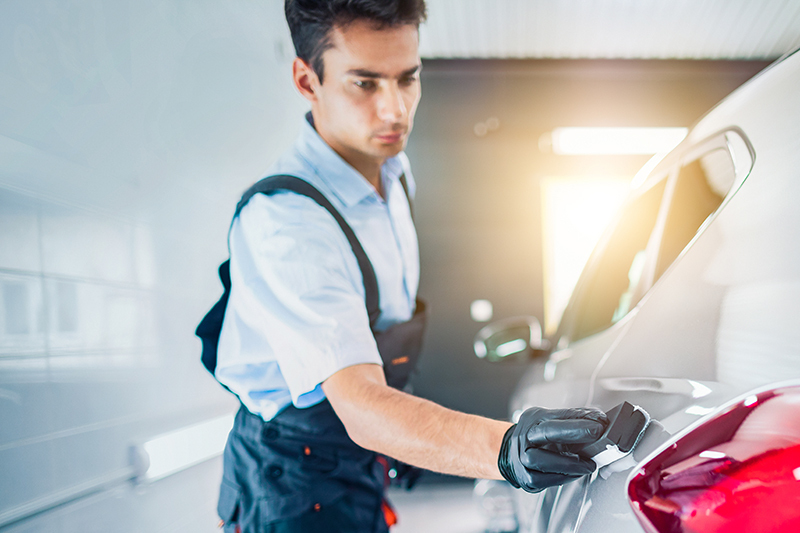 For this article on paint chip repair services, we speak with an expert in this area of the business to find out why carwash operators should include this service, what’s involved when incorporating it and how to execute it properly. Why should a carwash incorporate paint chip repair? Most, if not all, of the commercial paint chip repair kits available in the market today do not include the tools to rectify dents and dings, which usually require the expertise of a paintless dent repair service technician. However, if paint is missing from the affected area, it’s an opportunity for this specialty service, especially if auto body repair is also currently part of your business. And, many leading paint chip repair kits can also fix tiny scratches, commonly seen on darker painted vehicles. The point is, paint chip repair services can extend beyond just paint chips. Paint chip repair also protects your customers’ cars from further paint loss as well as against the formation of rust and corrosion. But, why sell this service at a professional carwash? According to Tony Pando, global business development for Dr. ColorChip Corporation, it’s a perfect match. As carwash competition surges and changes, especially as branded chains are becoming more widespread across the country, this service also offers a competitive differentiator advantage for early-adopting carwashes. As mentioned, it is an easy entry service, and many manufacturers offer their kits for commercial use and not under a franchise, often with accompanying marketing materials as well as before-and-after photos when educating customers. “Word-of-mouth advertising can be effective when creating loyalty for the overall business. But, quite frankly, this is a specialty service, and it’s not something that is offered at very many places, so it becomes a competitive differentiator,” says Pando, adding that this can be the difference between losing and gaining profits in the short- and long-term. How can a carwash incorporate paint chip repair? Similar to selling your high-end carwash packages as well as your additional services (such as vacuums), your employees, signage and customers play pivotal roles in the success of a newly incorporated paint chip repair service. Signage and word-of-mouth advertising can help attract attention to the service and hopefully draw customers in. However, it is your carwash’s customer-facing employees, especially greeters, who are instrumental in the success of the program, since customer awareness and education are critical. These employees must not only market your paint chip repair services, but they also need to enlighten customers about the presence of paint chips on their vehicles, the risks of leaving the areas unfixed and the cost savings your carwash can offer over an auto body repair shop, for instance. Attractive and informational signage that brands and cross-sells paint chip repair with your carwashing services (such as “buy a paint chip repair service and get a free carwash”) is also considered a best practice. Still, says Pando, hiring, retaining and incentivizing greeters and attendants, or what he calls “qualifying agents,” is the key to profits when incorporating this service. What are the paint chip repair steps? Match the color of the vehicle to the color of the paint by eye. Put on a disposable glove. Insert the brush into the paint bottle. Blob the paint next to the paint chip. Flick the paint with the brush toward the chip. Allow time for drying (some leading products can dry in under five minutes). Once the area is dry, shake and then apply a “step two” blending solution to a cloth. Rub the cloth in a flat and very gentle, fast way in all directions. Wait about a minute or less, and then take a microfiber towel and buff the repaired area to a shine. Modern paint chip repair kits, which feature universal colors, are intended to be used with clear-coat vehicle surfaces. Therefore, when an older car’s enamel-painted vehicle comes to your carwash, which is becoming increasingly rare since many older cars have been repainted in the past three decades, some precautionary steps are required. Technicians must be more patient when applying, allowing for adequate drying and not rubbing as hard and as long as when servicing clear-coat surfaces. In terms of the best times of the year to sell this service at your carwash, while paint chips occur throughout the year, it appears that the spring and fall months seem to be popular among customers. Since employees play a critical role in the success of your paint chip repair services, it is important to incentivize and compensate the successful ones appropriately. Also, because educating the customers properly is such an important part of this process, operators must not consider paint chip repair as something that can sell itself. Commit to its success, and the result will be a chipper owner and more loyal customers.